MOSCOW, June 24. /TASS/. Russia’s air defense system manufacturer Almaz-Antey has conducted successful testing of the newest Buk-M3 air defense missile system. The tests took place at the Kapustin Yar range near Astrakhan, Southern Russia, the company reported Friday. “In June 2016, experts of the JSC Concern Almaz-Antey test fired a missile from the Buk-M 3 new advanced medium-range air defense missile system on a ballistic target at the Kapustin Yar range,” the company press service said, adding that the Pensne (Pince-nez) target missile was used during the testing. Almaz-Antey CEO Yan Novikov was quoted by the press service as saying that the target tracking was stable, despite the adverse weather conditions. “The launched missile hit the target as it entered the effective area,” he said. 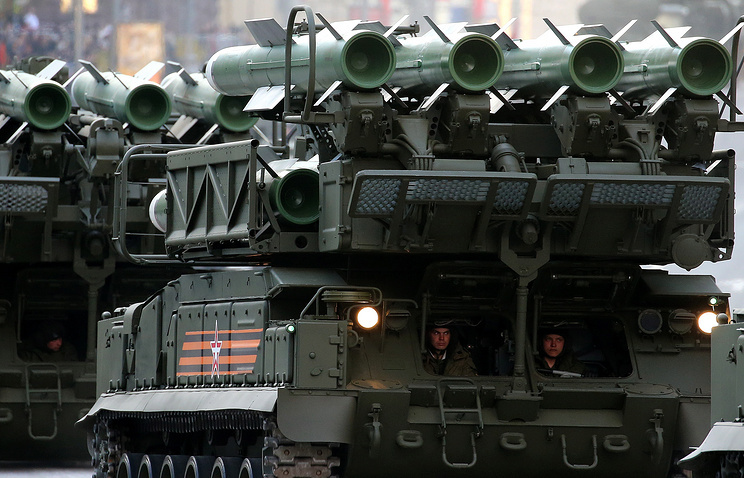 Novikov said that the Russian military should receive the first brigade set of the new Buk system in 2016. According to the Almaz-Antey press service, the tested missile “practically two times” surpasses in characteristics the previous models and is unrivalled among the world’s air defense missile systems of its class. “The new missile has a significantly lower weight. This has increased the missile system vehicle’s on-board ammunition capacity 1.5 times. The new system’s missiles are carried in containers and launched from them”, Almaz-Antey said. Head of the Russian Air Defense Forces Alexander Leonov said previously that “a unique new missile” was created for the Buk-M3 version. A new cutting-edge missile has been created for the Buk-M3 medium-range air defense missile system, he said. “The self-propelled system’s transport and firing boxes are designed to hold six missiles. Missiles are more compact but are more precise and capable of flying longer distances. So, it can be called a new unique missile capable of efficiently hitting air targets,” he said. He said the capacity of the new missile system had been boosted by 1.5 times as it is capable of holding six missiles instead of four. Russian Defense Minister Sergei Shoigu said previously there were plans to make operational the first brigade set of the new Buk system in 2016.